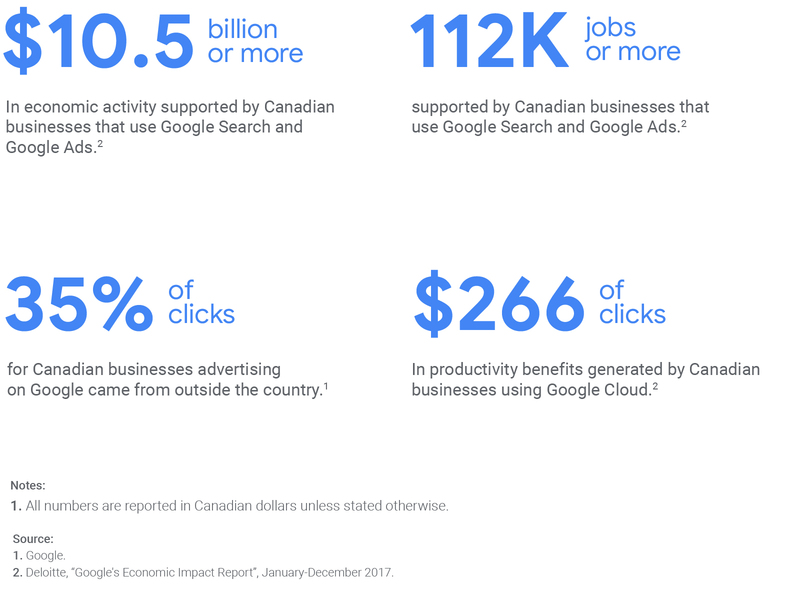 Canadian businesses created $10.4 billion in economic activity last year just through the use of Google Search and Google Ads, according to an Economic Impact Report commissioned by the search giant and conducted by Deloitte. The report aims to assess the economic impact of several Google services including Search, Ads, AdSense, Google Cloud, and Android in 2017, writes Craig Alexander, Deloitte’s chief economist, in the report. It doesn’t consider the impact of Google’s own investments or intellectual property. He also says that assessing economic impact in the digital services is hard. range provides both a conservative minimum value and a potential upper bound to the value,” Alexander states. Numbers from a Google-commissioned report on its economic impact in Canada. The $10.4 billion put forward by Google in a press release and blog post about the report is actually the low range of Deloitte’s estimate, which ranges as high as $18.4 billion of activity related to Google Search and Ads. It also provides a range of other estimates, such as 112,000 to 2000,000 jobs that are supported by the businesses using those services and $1.5 billion in revenue supported by Android in Canada’s app economy. 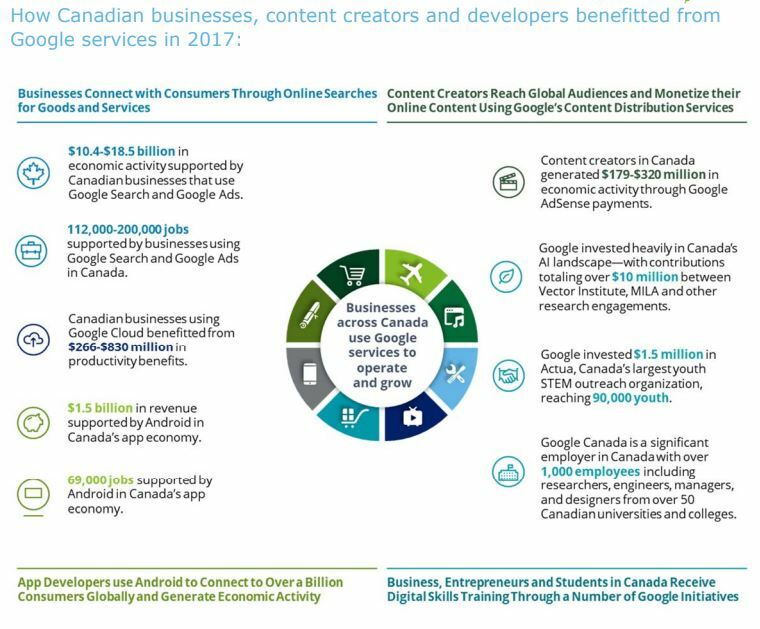 From Deloitte’s report on Google’s Economic Impact in Canada for 2017. There’s a separate breakout for Quebec, estimating $2.2 to $3.9 billion in economic activity from businesses using Google Search and Google Ads. The direct impact of profits received through use of Google’s services. The indirect impact of greater demand for those businesses traveling down the supply chain. The induced impact of consumer spending of those working at businesses using Google services and their suppliers. The report is unique in exploring the overall impact that Google has on the Canadian economy, says Trevin Stratton, the chief economist at the Canadian Chamber of Commerce. Google may be in an exceptional position where it is able to use its services to improve productivity across a number of different sectors and industries. “New innovations in terms of technology can have a positive impact on our economy as a whole,” Stratten says. If some all-powerful villain were to snap his fingers and cause Google to disappear off the face of the earth tomorrow, it’s hard to imagine the economic impact being replaced by other firms. One point the report hammers home is that the impact of Google’s services are only going to continue to grow in the future. Take Google AdSense for example, the programmatic advertising platform used by online publishers that generated between $179 to $320 million in 2017. Deloitte cites a Research and Markets study from 2016 that programmatic ad spending will rise from $44.5 billion USD in 2017 to $68.7 billion in 2020. Another example of a growth trend is online video advertising revenue, with Deloitte pointing to an IAB study showing it rose 34 per cent from 2015 to 2016. Google says 19 million Canadians accessed video through a Google-owned site in 2017, presumably most of them via Youtube. 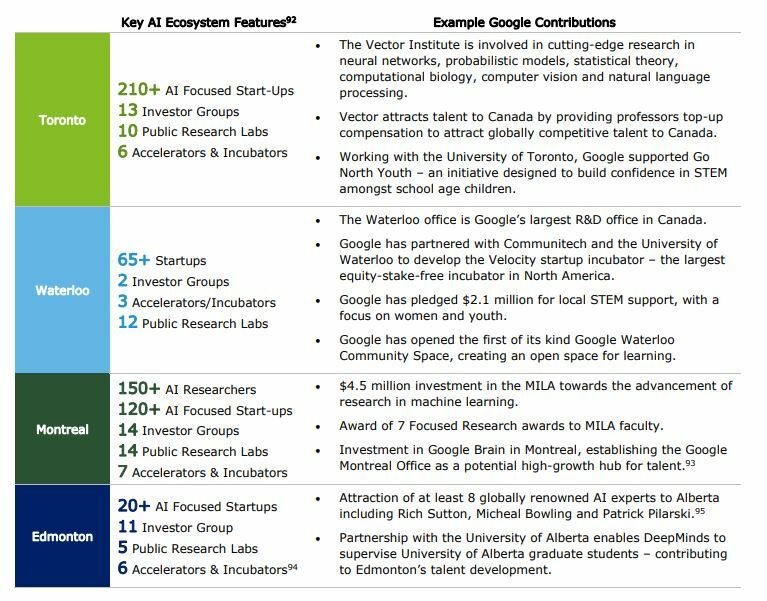 The report also has a section about Google’s artificial intelligence (AI) investments in Canada. It depicts Google’s role as one of helping to develop the AI talent in the country. This is achieved, the report says, by investing in organizations like the Vector Institute, Montreal Institute for Learning Algorithms, Google Brain offices in Toronto and Montreal, and Deepmind Edmonton and Montreal.